They consider “failures in care delivery” to include failures to execute preventive services or safety best practices, resulting in avoidable adverse events that require expensive remediation. By “failures of care coordination,” they mean care that is fragmented, such as poorly planned transitions of care, resulting in avoidable hospital readmissions. They categorize as “overtreatment” care ordered by providers that ignored scientific evidence, were motivated to increase income or to avoid medical malpractice liability, or out of convenience or habit. They considered “administrative complexity” to be spending resulting from “inefficient or flawed rules” of insurance companies, government agencies or accreditation organizations. They estimated the magnitude of administrative complexity by comparing administrative expense in the US to that in Canada’s single payer system. They considered “pricing failures” to be prices that are greater than those which are justified by cost of production plus a “reasonable profit,” presumably due to the absence of price transparency or market competition. Finally, they considered “fraud and abuse” to be the cost of fake medical bills and the additional inspections and regulations to catch such wrongdoing. 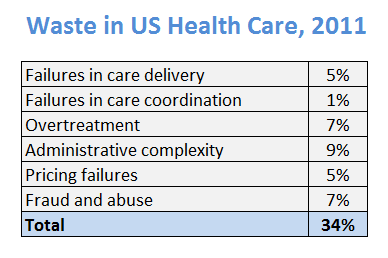 These estimates are generally in alignment with other attempts to categorize and assess the magnitude of waste in health care. 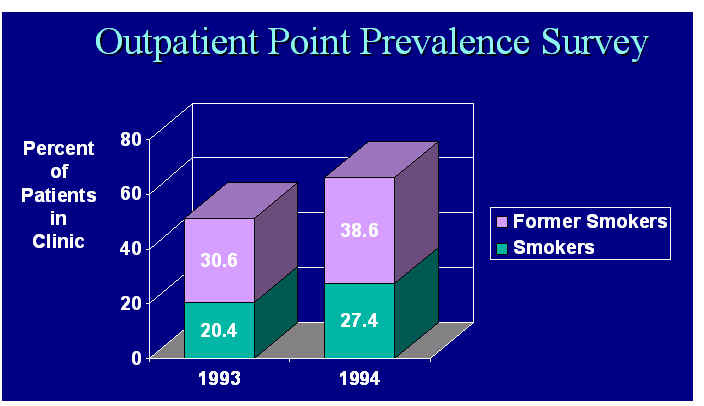 But, I think Berwick and Hackbarth’s estimates of “overtreatment” are probably far too low. That’s because they, like so many other health care leaders, are so reluctant to address the issue of cost-effectiveness. Obviously, the definition of over-treatment depends on one’s philosophy for determining what treatments are necessary in the first place. Everyone would agree that a service that does more harm than good for the patient is not necessary. 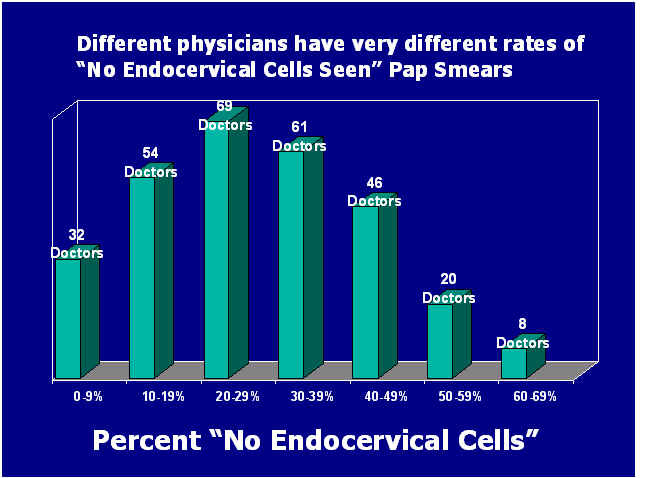 Most would agree that a service that a competent, informed patient does not want is not necessary. Some argue that, if there is no evidence that a treatment is effective, it should not be considered necessary, while others argue that even unproven treatments should be considered necessary if the patients wants it. Berwick and Hackbarth are ambiguous about their application of this last category. 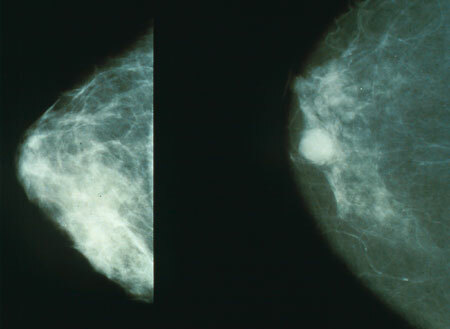 But, the big disagreement occurs when evaluating treatments for which there is evidence that the treatment offers some benefit, but the magnitude of the benefit is small in relation to the cost of the treatment. This is a question about cost-effectiveness. It is at the heart of medical economics. In my experience, most health care leaders and an even higher proportion of political leaders choose to deny the principles of medical economics and the concept of cost-effectiveness. They describe attempts to apply those principles as “rationing” — a term which has taken on a sinister, greedy meaning, rather than connoting the sincere application of rational thought to the allocation of limited resources. Berwick and Hackbarth implicitly take that view. They are unwilling to define over-treatment based on cost-ineffectiveness. 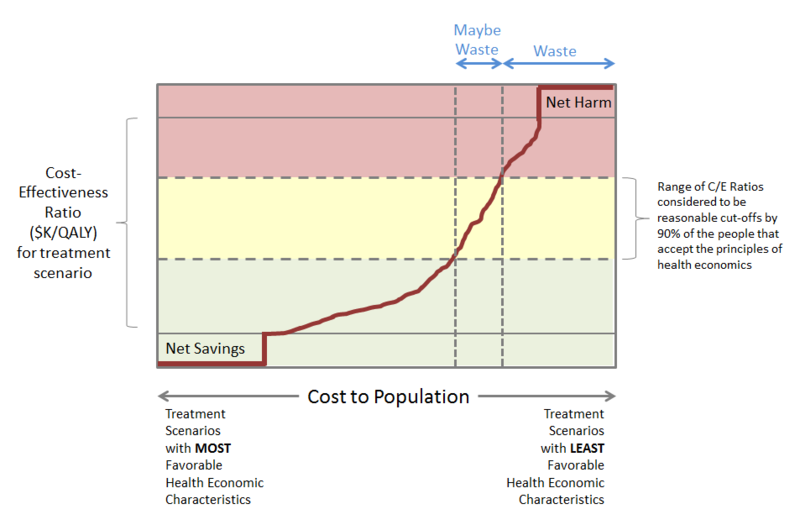 For years, I’ve been looking for an analysis that attempted to estimate the magnitude of waste from over-treatment based on the principles of health economics. The diagram below illustrates the hypothetical results of the type of analysis I’d like to see. In this diagram, the horizontal axis represents the total cost of health care to a population. I don’t want to see the entire US health care system. What is more relevant is the population served by an Accountable Care Organization or an HMO. To create such a diagram, we would first need to break down health care cost into a large number of specific treatment scenarios. 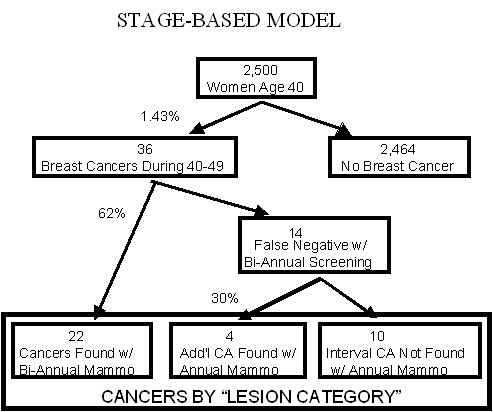 Each of these scenarios would specify a particular treatment (or diagnostic test) with enough clinical context to permit an assessment of the likely health and economic outcomes. For each scenario, each of the possible health outcomes would be assigned a probability, a duration, and a quality of life factor. My multiplying the duration by the quality of life factor, we could calculate the “quality-adjusted life years” (or “QALY”) for the outcome. 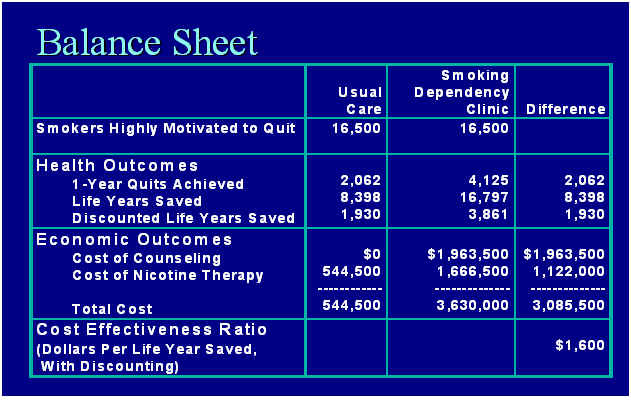 Then, by taking the probability-weighted average of all the possible health states for the scenario, and then dividing the result by the cost, we could calculate the “cost-effectiveness ratio” for the scenario, measured in “$/QALY.” Then, we would sort all the treatment scenarios by the cost-effectiveness ratios, with the treatment scenarios with the most favorable health economic characteristics on the left. 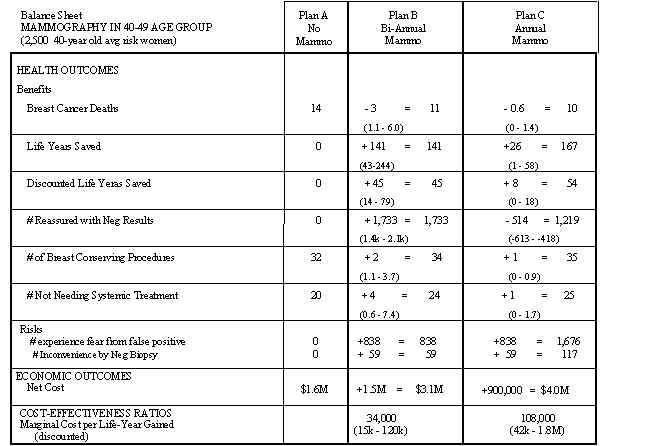 Some of the scenarios will generate net savings, such as for certain preventive services where the cost of the avoided disease is greater than the initial cost of the preventive service. These are clearly cost-effective. On the other end of the spectrum are scenarios that offer net harm to the patient, such as when adverse side-effects are worse than the benefits of the treatment. These are clearly cost-ineffective. In the middle of these extremes are scenarios where there is a positive net benefit to the patient and a positive net cost borne by the population. If a person rejects the principles of health economics, they would consider all of these middle scenarios to be “necessary” or “appropriate” regardless of how small the benefits or how large the costs. But, among those who accept the principles of health economics, some of these scenarios could be judged to be cost-effective and others to be cost-ineffective. Such judgments would presumably reveal some threshold cost-effectiveness ratio that generally separated the scenarios into cost-effective and cost-ineffective. Since different people have different values, their judgments could reveal different cost-effectiveness thresholds. If we had many people making these judgments, we could find a range of cost-effectiveness ratios that were considered to be reasonable by 90% of the people. Applying this range to all the treatment scenarios, one could find a group of scenarios that were considered wasteful by most, and another group of scenarios that were considered wasteful only by some. Variations on this theme have been used throughout the world for decades by various practice guidelines developers, healthcare policy analysts, health services researchers and health economists. It is complex and time-consuming. As I’ve discussed before, it is also controversial in the United States. Right now, in the US, we all recognize that health care costs are too high. We’re all focusing on merging providers into larger organizations, installing computer software, and exploring new reimbursement arrangements to address the problem. But, I’m convinced that over-treatment with cost-ineffective services is a major source of waste. 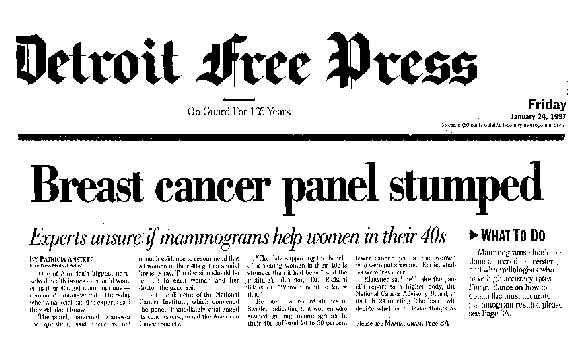 We will inevitably get back to the core issue of having to figure out which treatment scenarios are wasteful. We will inevitably have to overcome our denial of health economics and our irrational fear of rational allocation. The debate about what to maximize when selecting candidates for care management programs: Accuracy? ROI? Net Savings? 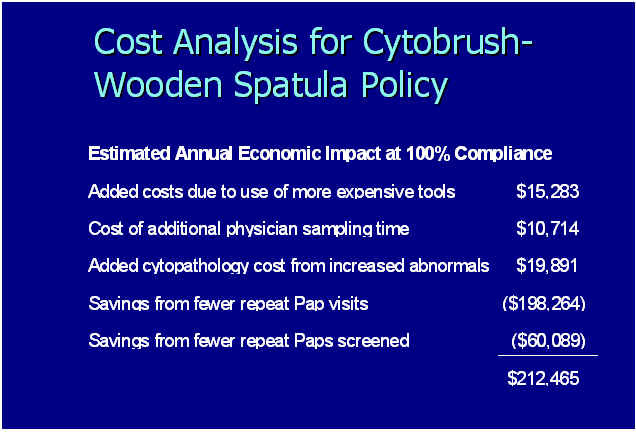 Or Cost-Effectiveness? When doing analysis, it is really important to clarify up front what it is you are actually trying to figure out. This sounds so obvious. But, I am always amazed at how often sophisticated, eager analysts can zip past this important first step. Health plans, vendors and health care providers are all involved in the design and execution of wellness and care management programs. 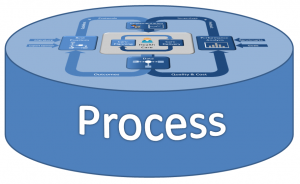 Each program can be conceptualized as some intervention process applied to some target population. A program is going to add more value if the target population is comprised of the people for whom the intervention process can have the greatest beneficial impact. I have found it useful to conceptualize the process of selecting the final target population as having two parts. 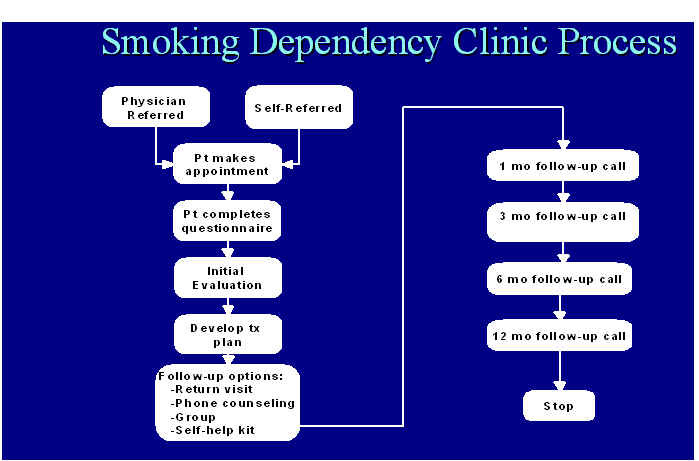 The first part is the process of identification of the population for whom the intervention process is deemed relevant. For example, a diabetes disease management program is only relevant to patients with diabetes. An acute-care-to-ambulatory-care transitions program is only relevant to people in an acute care hospital. 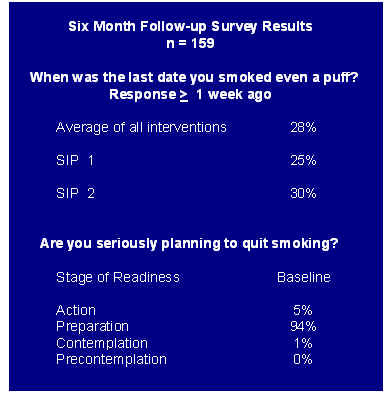 A smoking cessation program is only relevant to smokers. The second part is to determine which members of the relevant population are to actually be targeted. To do this, a program designer must figure out what characteristics of the relevant candidates are associated with having a higher opportunity to benefit from the intervention. For example, in disease management programs, program designers often use scores from predictive models designed to predict expected cost or probability of disease-related hospitalization. They are using cost or likelihood of hospitalization as a proxy for the opportunity of the disease management program to be beneficial. Program designers figure that higher utilization or cost means that there is more to be saved. 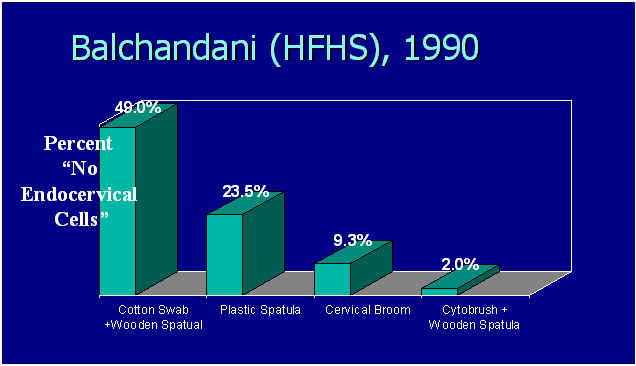 This is illustrated in the graph below, where a predictive model is used to sort patients into percentile buckets. 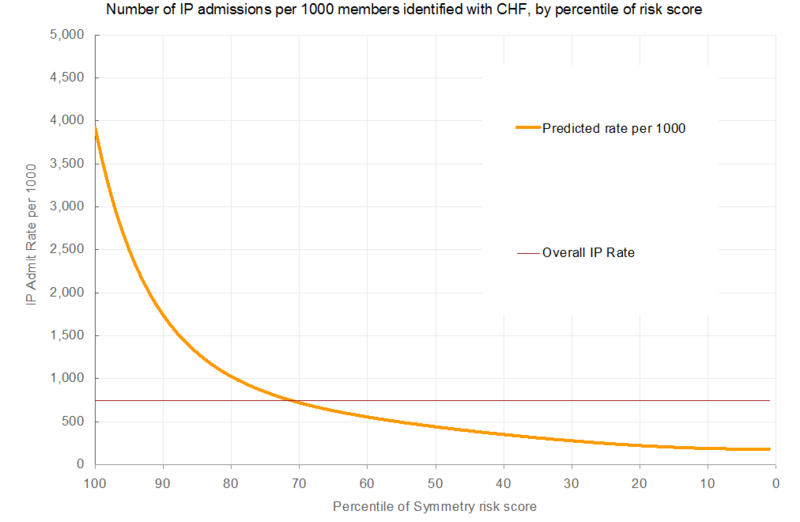 The highest-opportunity 1% have have an expected annual admit rate of almost 4000 admits per 1000 members, while the lowest 1% have less than 200 admits per 1000 members. 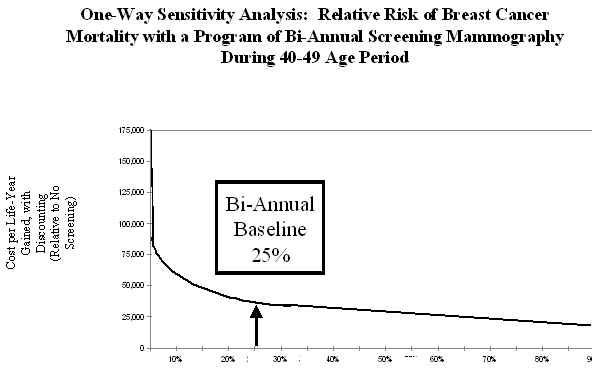 A predictive model is doing a better job when more of the area under this curve is shifted to the left. 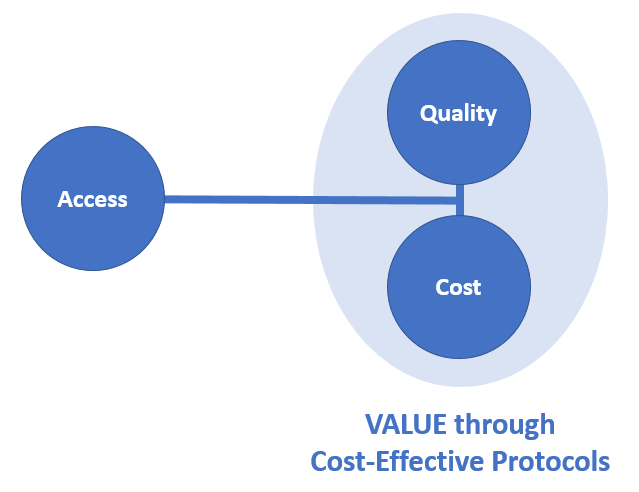 Although it is common to use expected cost or use as a proxy for opportunity, what a program designer would really like to know is how much good the intervention process is likely to do. Other variables besides expected cost or use can contribute to a higher opportunity. For example, in a disease management program, the program might be more worthwhile for a patient that is already motivated to change their self-management behaviors or one that had known gaps in care or treatment non-compliance issues that the intervention process is designed to address. As illustrated by the red line in the graph above, there is some fixed cost to operating the program, regardless of the target rate. For example, there are data processing costs. Then, if the program does outreach to a greater and greater portion of the relevant population, more and more people say “yes” and the costs for the intervention go up in a more or less linear manner. As shown by the green line, the savings increase rapidly at first, when the program is targeting the candidates with the greatest opportunity. But, as the threshold for targeting is shifted to the right, the additional candidates being targeted have lower opportunity, and the green line begins to flatten. The blue line shows the result of subtracting the costs from the savings to get net savings. It shows that net savings increases for a while and then begins to decrease, as the cost of intervening with additional patients begins to outweigh the savings expected to accrue from those patients. 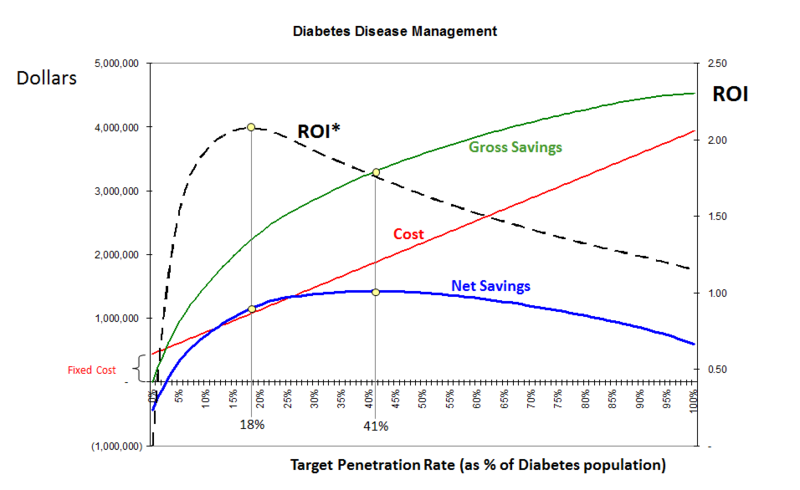 In this analysis, net savings is highest when 41% of the relevant population of diabetic patients is targeted for the diabetes disease management program. 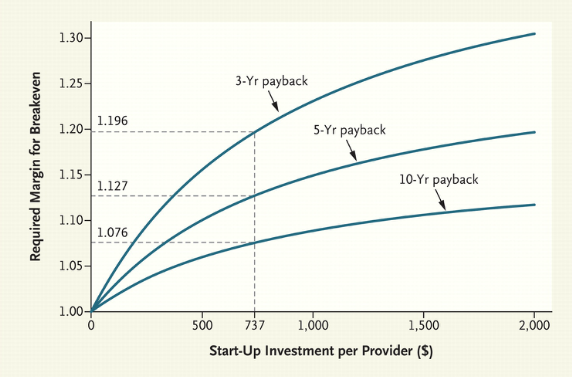 The black dotted line shows the result of dividing savings by cost to get the return of investment, or ROI. With very low target rates, too few patients are accumulating savings to overcome the fixed cost. So the ROI is less than 1. Then, the ROI hits a peak at a target rate of 18%, and declines thereafter. This decline is expected, since we are starting with the highest opportunity patients and working down to lower opportunity patients. Note that in this analysis, increasing the target penetration rate from 18% to 41% leads to a lower ROI, but the net savings increases by 24%. So, if the goal is to reduce overall cost, that is achieved by maximizing net savings, not by maximizing ROI. Should we try to maximize accuracy? 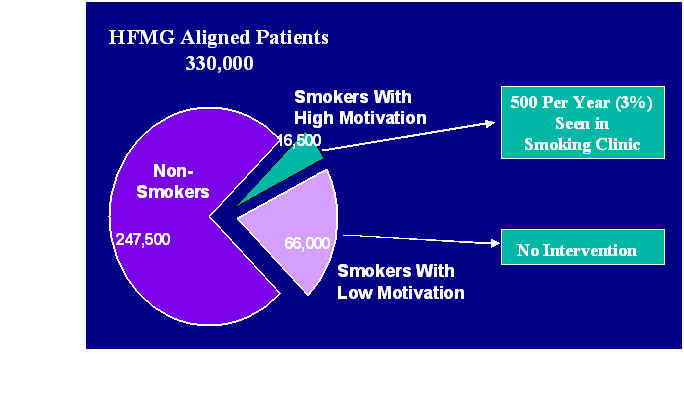 In a recent paper published in the journal Population Health Management by Shannon Murphy, Heather Castro and Martha Sylvia from Johns Hopkins HealthCare, the authors describe their sophisticated methodology for targeting for disease management programs using “condition-specific cut-points.” A close examination of the method reveals that it is fundamentally designed to maximize the “accuracy” of the targeting process in terms of correctly identifying in advance the members of the relevant disease-specific population that will end up being among the 5% of members with the highest actual cost. In this context, the word accuracy is a technical term used by epidemiologists. 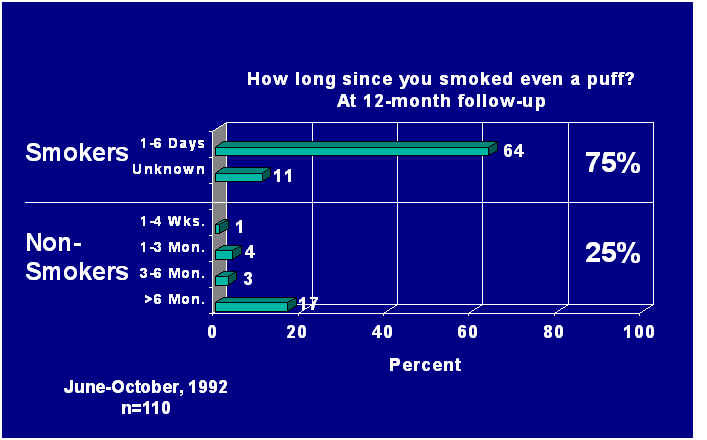 It means the percentage of time that the predictive model, at the selected cut-point, correctly categorized patients. 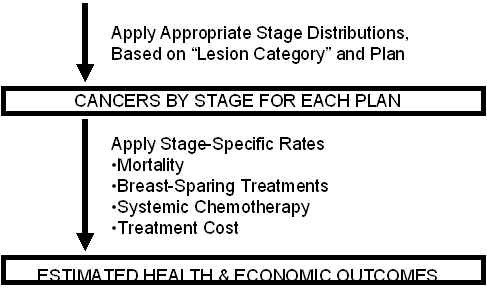 In this application, the categorization is attempting to correctly sort patients into a group that would end up among the 5% with highest cost vs. a group that would not. 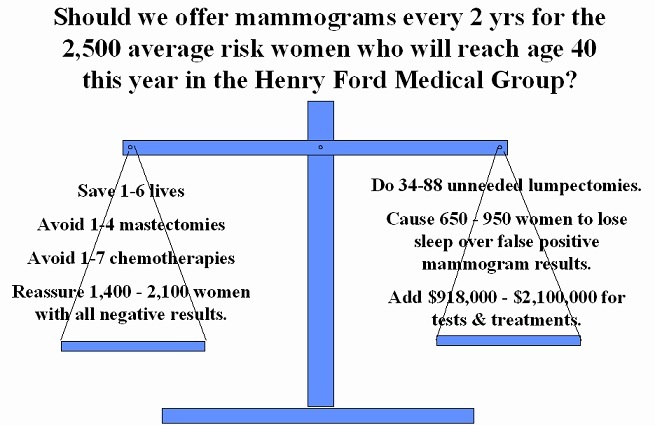 By selecting the cut point based accuracy, the Hopkins methodology is implicitly equating the value of the two types of inaccuracy: false positives, where the patient would be targeted but would not have been in the high cost group, and false negatives, where the patient would not be targeted but would have been in the high cost group. But, there is no reason to think that, in the selection of targets for care management interventions, false negatives and false positive would have the same value. The value of avoiding a false negative includes the health benefits and health care cost savings that would be expected by offering the intervention. 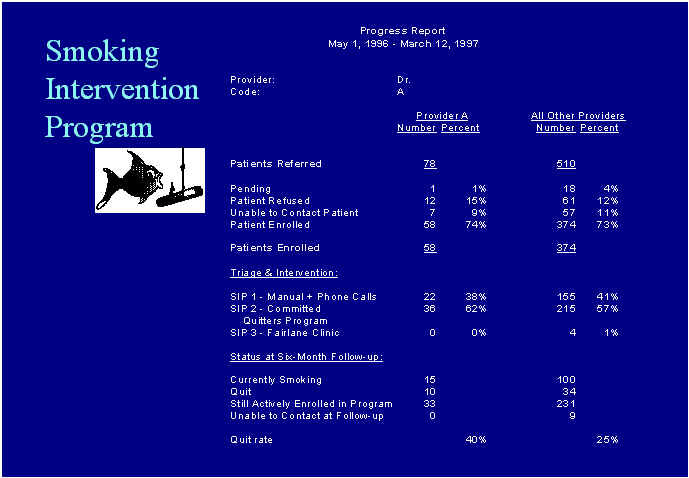 The value of avoiding a false positive includes the program cost of the intervention. There is no reason to think that these values are equivalent. 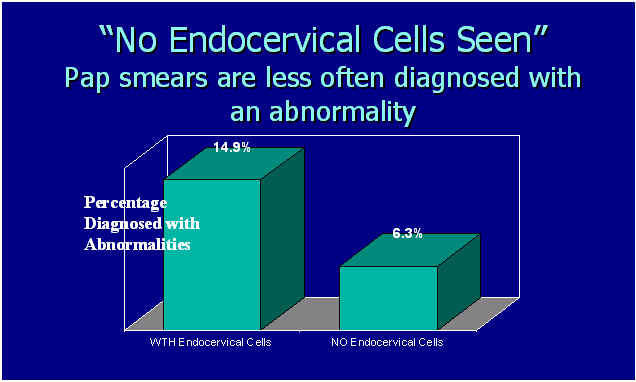 If it is more important to avoid a false positive, then a lower cut-point is optimal. If it is more valuable to avoid a false negative, then a higher cut-point is optimal. Furthermore, the 5% cost threshold used in the Hopkins methodology is completely arbitrary, selected without regard to the marginal costs or benefits of the intervention process at that threshold. Therefore, I don’t advise adopting the methodology proposed by the Hopkins team. The concept of maximizing ROI or net savings is based on the idea that the reason a health plan invests in these programs is to save money. But, the whole purpose of a health plan is to cover expenses for necessary health care services for the beneficiaries. A health plan does not determine whether to cover hip replacement surgery based on whether it will save money. They cover hip replacements surgery based on whether it is considered a “standard practice,” or whether there is adequate evidence proving that the surgery is efficacious. Ideally, health care services are determined based on whether they are worthwhile — whether the entire collection of health and economic outcomes is deemed to be favorable to available alternatives. In the case of hip replacement surgery, the health outcomes include pain reduction, physical function improvement, and various possible complications such as surgical mortality, stroke during recovery, etc. Economic outcomes include the cost of the surgery, and the cost of dealing with complications, rehabilitation and follow-up, and the savings from avoiding whatever health care would have been required to deal with ongoing pain and disability. 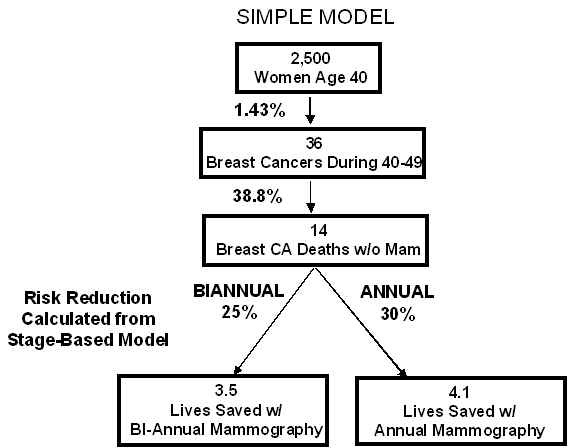 When attempting to compare alternatives with diverse outcomes, it is helpful to reduce all health outcomes into a single summary measure, such as the Quality-Adjusted Life Year (QALY). Then, the incremental net cost is divided by the incremental QALYs to calculate the cost-effectiveness ratio, which is analogous to the business concept of return on investment. If the cost-effectiveness ratio is sufficiently high, the health service is deemed worth doing. There is no reason why wellness and care management interventions should not be considered along with other health care services based on cost effectiveness criteria. The idea that wellness and care management interventions should only be done if they save money is really just a consequence of the approach being primarily initiated by health plans in the last decade. I suspect that as care management services shift from health plans to health care providers over the next few years, there will be increased pressure to use the same decision criteria as is used for other provider-delivered health care services. 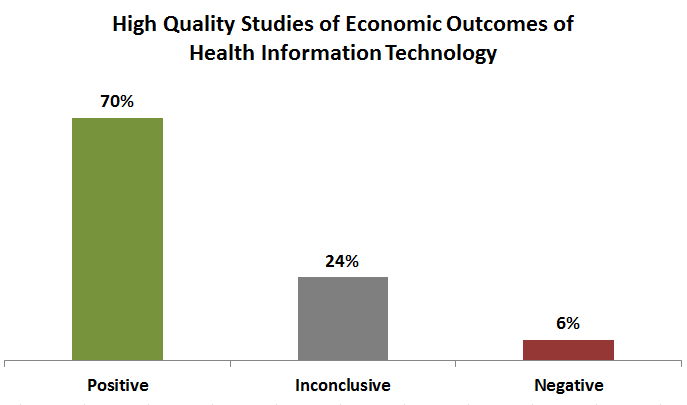 Why do other countries have different attitudes about Health Economics? Wednesday morning, I attended a thought-provoking panel discussion entitled “Is Health Economics an Un-American Activity?” — a reference to the McCarthy-era Congressional committees that judged Hollywood movie directors and others considered to be communist sympathizers. 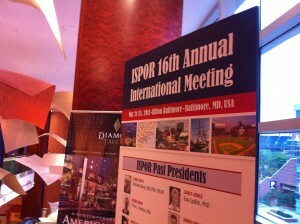 The panel presentation was part of the annual meeting of the International Society for Pharmacoeconomics and Outcomes Research (ISPOR) in Baltimore. 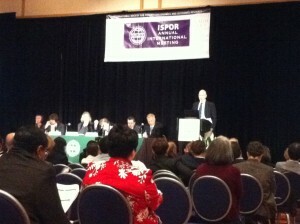 It featured John Bridges, PhD from Johns Hopkins, Peter Neumann, ScD from Tufts, and Jeff White, PharmD, from WellPoint. The panel noted that the United States is far less supportive of these basic concepts of the field of health economics, compared to almost all other developed nations. In the U.S. stimulus bill, Congress provided substantial new funding to establish a Patient-Centered Outcomes Research Institute (PCORI). But, Congress specifically forbade that Institute from using QALYs or establishing cost-effectiveness thresholds. In the debates leading up to passage of the health care reform legislation, U.S. political leaders went out of their way to emphasize that they did not condone any type of “rationing” or “death panels.” In contrast, the ISPOR meeting was full of presentations by health economists from Europe, Australia, Asia and elsewhere describing their government-sponsored programs to formally assess the cost-effectiveness of heath services and to use those assessments to determine whether to grant market access to drugs, biomedical devices and other health care products and services. Although the panel discussion was enlightening and interesting, I felt they generally focused too much on QALYs and too little on the deeper cultural issues. They made only vague comments on any evidence or theories about why there would be a such an obvious difference in attitudes between the US and other developed countries. One presenter noted that America was founded by individuals fleeing tyranny, which led Americans to be distrustful of government hundreds of years later. Another jokingly hypothesized that support for health economics had something to do with having a monarchy. So why does the US see things differently? It seems to me that there are two competing explanations for why Americans are so troubled by health economics and cost-effectiveness analysis: Entitlement and Duty. According to the entitlement hypothesis, after a few generations of economic largess, Americans have come to feel entitled to a worry-free life. As a result, Americans are supposedly unwilling to accept limits or burdens. This is described as the decline of our culture. It supposedly applies not only to health care, but also to our unwillingness to make tough decisions and sacrifices to solve the federal budget deficit, global warming, urban sprawl and even childhood obesity. Both political parties implicitly support this view when they assert that their party will revive American exceptionalism and put the country back on the right track. This sense of entitlement applies to both rich and poor. Rich people hate rationing because they associate it with big government, which they equate with high taxes to pay for generous social welfare programs that transfer their wealth to the poor. Poor people hate rationing because they fear that it will provide the pretext for the “establishment” to avoid providing them with the high quality health care to which they feel entitled. According to the entitlement hypothesis, both rich and poor are like spoiled children, stomping their feet at the prospect of any limits to the health care they expect. In contrast, the duty hypothesis makes seemingly opposite assumptions about the state of American culture. It emphasizes that Americans have a strong sense of duty, and a romantic sense of chivalry, loyalty and patriotism. They note that Americans, compared to their European counterparts, tend to have more fundamentalist religious beliefs. Americans tend to have a strong sense of right and wrong, seeing moral issues as black and white, rather than the more relativistic shades of grey prevalent in attitudes of those from other developed countries. Advocates of this hypothesis point out that Americans feel strongly about not leaving a soldier behind in battle, no matter what the risk. This sense of duty translates to an insistence that we spare no expense to rescue the sick from illness. I can’t say I know which point of view is right. Perhaps both forces are at work to animate Americans’ opposition to health economics. What are the implications for ACOs? ACOs involve providers taking responsibility for the quality and cost of care for a population. Controlling cost requires reducing waste. Many health care leaders would like to believe that we can control costs just by eliminating medical procedures that offer zero benefit or that actually harm patients, and by creating leaner care delivery processes so each necessary service is delivered at lower cost. But, the elephant in the room is the far larger waste in the form of delivery of procedures that do offer some benefit — just not enough to be worth the high cost. Reducing the use of such procedures will face opposition and resistance. To be successful in the face of such resistance, ACOs must overcome the sense of entitlement. ACOs must channel the strong sense of American duty, honor and righteousness to the act of triaging to help the people who need high value services. The courts and churches use rituals and solemn settings to convey solemnity, seriousness and integrity. Perhaps ACOs should use some form of ritual and a solemn setting to build a sense of rigor, transparency and integrity to the process of determining practice guidelines that direct resources to the “right” clinical needs. In this manner, the US culture of duty could potentially overcome any sense of entitlement, enabling the ACO to carry out its stewardship duties and responsibilities regarding quality and cost of care for the population. I suspect that for-profit health care provider organizations will have a far more difficult time overcoming this resistance to health economics. For people to internalize a sense of duty to triage, they must have confidence that when practice guidelines cause providers to say no to one patient regarding a low value service, the preserved resources go instead to provide a high value service to another patient. If they suspect the savings is going into the pockets of stockholders, the cultural opposition to health economics will be strengthened.